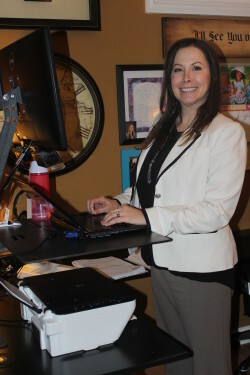 Brown & Jones’ Court Reporter Rachel Gwidt edits her transcript using a standing work station. We live in an obesigenic culture, where sedentary lifestyles, advertising, and food availability conspire to make us gain weight. As a result, more than two thirds of American adults are overweight, leading to obesity-related diseases such as diabetes, high blood pressure, and heart disease. Unfortunately, experts say dieting alone isn’t the answer- we can consume calories far more quickly than we can burn them through exercise. So, the article goes on to say, “exercise doesn’t work. Diets don’t work. What does?” The answer may be “energy flux,” where the secret is simply to move– not for a specified amount of time or intensity- just move more. In the 1950s, Harvard nutrition professor Jean Mayer, Ph.D., studied the diet, exercise, and weight of a group of working men. Workers were divided into five groups according to physical demands of their jobs: sedentary (1), light work (2), up to very heavy work (5). Surprisingly, groups 2 through 5 weighed roughly the same; these men achieved a natural balance between their calories consumed and calories burned, independent of their diets. The sedentary workers in Group 1 found no such balance. They ate more than they needed and put on more weight than the others. The study concluded that humans have evolved to exercise a certain amount every day. When we do, our energy flux remains in balance, but without daily exercise, the weight-control system malfunctions. We've centered much of the discussion on this blog about how court reporting services continue to be valuable once the trial or deposition has ended. While there is definitely merit in having a realtime court reporter present to refer back to the record during the legal proceeding itself, the most valuable contribution they make is the official transcript that they submit to the courts. That document can be put to a wide variety of uses. Whether it ends up being used as evidence in future trials or referred to by investigators looking back at a certain case, it's not uncommon for many different types of individuals to come looking for court transcripts. However, in New York, it appears one case's transcript will be used for an unusual purpose: an Off-Broadway play. Next week, Kupferberg Center for the Arts will be presenting the Off-Broadway performance of "De Novo," the story of a New York City gang member that attempts to leave the violent culture to try to find a new life. The play's title, which is a term often used in law, is derived from Latin and translates to "from the beginning" or "anew." The story of "De Novo" focuses on the tale of Edgar Chocoy, a 14-year-old Guatemalan boy, who grew up in New York City with no family but his fellow gang members. Eventually, Chocoy realized he wanted to separate himself from that lifestyle, but was barred from doing so from the gang, who demanded he pay a fine. In order to escape, Chocoy moved away to Los Angeles. However, he was denied asylum there by an immigration judge and was deported back to Guatemala, where he was murdered 17 days later. Whether it's local case covered by Milwaukee court reporters, or the story of a lost teen in a gang, it's important to remember that every legal proceeding needs the best in transcription services. In a press release soliciting nominations for the Santo J. Aurelio Award, a spokesperson for the National Court Reporters Foundation (NCRF) said the organization was looking to honor a "long-time court reporter who has given back selflessly to the profession or community." To be nominated for the Aurelio Award, an individual must have been working as a court reporter for at least 25 years and demonstrated altruistic behavior throughout the course of his or her career. Nominees must also be either a participating or registered member of the National Court Reporters Association (NCRA), or a retired participating or registered member. "We all know people like this, so look around you and take a few moments and submit a nomination," the NCRF said in a statement. The award will be presented at an "awards luncheon" on August 10 at the NCRA's annual Convention and Expo in Nashville, Tennessee. In addition to the Aurelio Award, the CASE Award of Excellence and Student Scholarships will be presented. Furthermore, the newest group of Fellows of the Academy of Professional Reporting and the champions of the Realtime and Speed competitions will be recognized. Anyone interested in attending the convention should review the brochure available through the NCRA website, which offers more information about the four-day event's agenda, as well as registration details. Certified court reporters have an important job that is highly respected in the legal world. Without realtime court reporting, subtle nuances in witness testimony can be overlooked or small details within a trial can be missed. A strong court transcript is essential to a case's outcome, which is why mentoring programs are often used. In the April edition of The Journal of Court Reporting, several experts in the field discussed the practice of an experienced court reporter working with less tenured individuals to help them become stronger. Susan Kiniry, RMR and chair of the Student Internship School Liaison Committee of the Pennsylvania Court Reporters Association, told the news source that mentoring programs are crucial to court reporting. "It allows the student someone else outside the instructor and their student peers to bond with and learn from," she said. "The mentors can provide students with additional opportunities to observe in the workplace and, as they progress in the program, to attend proceedings and gain real life experience with their skills." Kiniry added that once students near the end of their program, a mentor can assist – along with the school – in finding possible job opportunities. According to Lisa Selby-Brood, a court reporter and mentor, it is important for students to have a "cheerleader." She explained that when she was first starting out, there was no one to take her under their wing, answer questions or encourage her to join the state association. Furthermore, Selby-Brood said that she took a 17-year break to raise children, and then returned to the court reporting field. Even then, she had many questions involving computers, but luckily her boss was able to guide her. When court reporting mentorship programs are encouraged, the future of the industry is strengthened and courtrooms will continue to have strong, accurate transcripts. 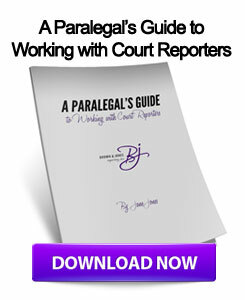 Previously, this blog discussed how court reporting was ranked as No. 4 on CareerCast's list of the "20 Great Jobs Without a College Degree." Not only can Milwaukee court reporters earn competitive salaries, they are working in a profession that is respected and admired. Individuals who have strong attention to detail, thrive in a fast-paced environment and have great communication skills will be able to thrive in a court reporting position. A more recent report from CareerCast also listed this job as the 68th best in the country. According to the website, the list was based on environment, income, outlook, and stress. With a robust hiring outlook, certified court reporters found themselves keeping pace with other positions that require a four-year college degree. Rocco LaDuca covers crime and courts at the Observer-Dispatch in Utica, New York. He explained to The Wall Street Journal that he would not be happy doing anything else because people in the community are affected by what he writes. "I'm not sure I'd be happy in another setting," he said. "I can't think of any job that would be as exciting or as fulfilling as this." A similar mindset can be taken by Wisconsin court reporters. Even as electronic recording devices are hitting the market, the need for strong individuals cannot be overlooked. Machines can miss important pauses, glances or even quietly spoken words that a real person will not scale over. By continuously providing realtime court reporting and services that are not possible with electronic reporting, the job market is likely to remain stable, according to the Bureau of Labor Statistics (BLS). On their website, the BLS explained that the number of court reporters is expected to grow through 2018 and that there will continue to be a need for accurate transcriptions of courtroom cases.